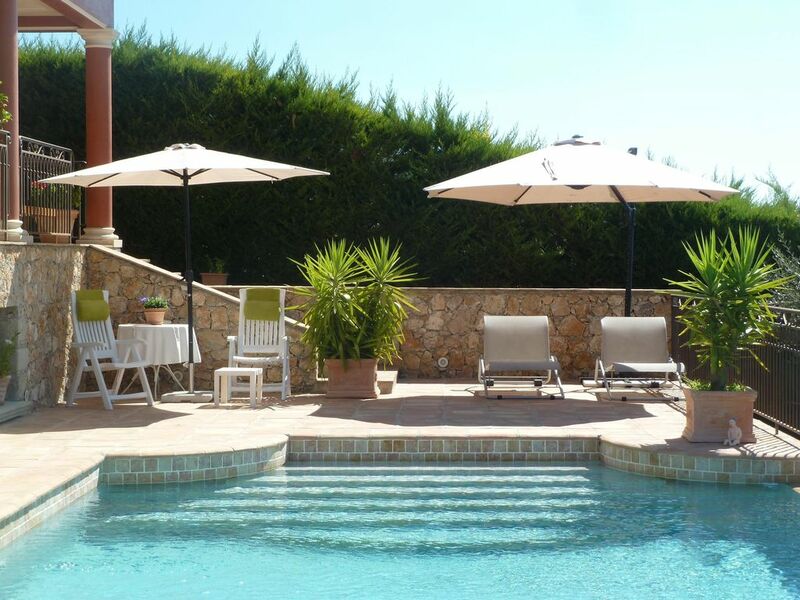 This spacious ground villa is ideally located between the sea and the Haut-Var. You will appreciate its typical Provencal markets, its festive activities, vineyards and wine cellars. The place is very quiet, located in height, with a panoramic view of the city and the Massif des Maures. The scenery changes with the light. This loft has 3 bedrooms including a huge living room of 120 m2, consisting of different areas. It is equipped with a kitchen overlooking a dining room, a cozy lounge, flat screen TV lounge, audio, karaoke, a corner office with iMac computers, Internet Broadband, Wifi, printer available and billiards French. Adjoining the central part are two parts. The first is a spacious room with air conditioning and communicates with a toilet equipped bathroom. A double bed of 1.60 m, motorized one hand, offers a true comfort. A second bedroom opens on the principal also accessible to the bathroom. Also, adjacent to this large living room, a linen room is at your disposal, equipped with a washing machine, tumble dryer, ironing board. This living space opens out onto a patio, with wrought iron table and chairs, protected from the sun by a beautiful olive tree and a large offset umbrella, where you can enjoy your meals outdoors. This patio gives access to the garden and tiled swimming pool, 10 x 5 mx 1.50 m located south with views overlooking the city and the Maures. Access to the swimming pool is free, (reserved for owners, 2 hours per day). On the beach of the swimming pool, an arbor shelters a living room of garden and 4 sunbathings and parasols. This villa floor is fully independent and designed to respect privacy. The property is protected by automatic gate and an alarm system. Draguignan is a typical Provençal town of about 40 000 h located close to the Mediterranean: In 30 minutes, you will be on the beaches of Ste Maxime, Issambres or Frejus. The mythical village of Saint-Tropez is facing Ste-Maxime where you can take the shuttle boat if you want to avoid in the summer, frequent traffic jams. The town is perfectly placed to explore the hinterland (Gorges du Verdon), picturesque villages (St Paul de Vence, Mougins, Vallauris) or the French Riviera (Cannes, Antibes, Monaco). On Saturday morning, you will love the atmosphere of the Provencal market located in the old Draguignan. Its restaurants, shops, pedestrian streets give the city a very nice character. Sink, cupboards, large mirror, walk-in shower, towel dryer, window. WC. housekeeping: End of stay, for 1 week rental: 60, - EUR included. If rental for 15 days: option of cleaning, mid week and costs 60, - euros extra, with change of linen. If only, provision of linen, during the stay: - Sheet and duvet cover: 15, - Euro per room. Nous avons passé d'agréables vacances à Draguignan haut dans un quartier calme. Chacun peut facilement y trouver sa place. Le logement est bien protégé des fortes chaleurs, de plus la chambre est climatisée. La literie y est de qualité. Les petites fenêtres sont équipées de moustiquaires. Dans la salle de bain, la douche est spacieuse. La piscine à débordement était chaude et claire. La terrasse qui la borde est vraiment parfaite. Plusieurs parasols protègent les chaises longues et un salon extérieur vous invite à l'apéro. C'est avec plaisir que nous avons fait la connaissance de Michel et Marie-Pierre qui sont d'excellents voisins et des propriétaires de bons conseils. Les distances sont très raisonnables pour visiter Nice, Monaco, les Gorges du Verdon, Tourtour, Saint Tropez, Saint Paul de Vence, l'abbaye du Thoronet et de nombreux magnifiques villages. Voila donc un endroit idéal pour passer un excellent séjour et de belles vacances. Très jolie villa aménagée avec beaucoup de goût. La description de la villa correspond en tout point à la réalité. La vue sur Draguignan en contre bas est superbe. Marie Pierre, notre hôtesse, est un cordon bleu si vous le souhaitez. La piscine à débordement (eau salée !!!) est magnifique et les abords sont décorés avec goût. Merci Olivier pour votre appréciation. Nous avons été bluffé par votre discrétion, méticulosité et l'excellente éducation de vos enfants. Merci d'avoir laissé les lieux impeccables. Excellent endroit pour rayonner dans la région et découvrir des sites touristiques remarquables (côte d'azur, gorges du Verdon, villages perchés etc...). L'appartement est confortable et parfaitement équipé et adapté pour un séjour en vacances. Nombreux matériels de qualité, jolis et peu fragiles. La discrétion et l'amabilité des propriétaires sont aussi très appréciables. We are a family of four with two teenage sons, and we very much enjoyed our 2 weeks stay in this apartment. The apartment itself is spacious, well equipped, and it was very clean on arrival. There were towels for all of us - both for indoor use, for the pool and even for the beach. However, the real treat of the property is the pool area which also was very clean. The pool is big and beautiful, and there are four sun beds, parasols and a nice seating area. There are only two things preventing us from rating this property with five stars. The wifi is somewhat unstable, and only one of the bedrooms has air-conditioning. The apartment feels fresh and somewhat cool even without air-conditioning, but at night, the bedroom without AC did get a little too hot - at least for us. However, our sons did not lose any sleep because of it. The owners live in the house. They are very nice, helpful and discrete. We would certainly recommend this property, but be aware that having a car is absolutely necessary. We certainly intend to install air conditioning in the second bedroom. We enjoyed your discreet stay and the god contact. Die mit viel Liebe zum Detail eingerichtete, sehr saubere, große Wohnung sorgte schnell für das überaus erholsame Gefühl, in der Region Provence-Alpes-Côte d'Azur bestens angekommen zu sein. Die Wohnung, die Einrichtung, der tolle Pool und die sehr netten Vermieter haben unsere Erwartungen deutlich übertroffen. Bei großer Hitze hatten wir so manchen schönen, ruhigen Tag am Pool verbracht. Die Lage des Ortes ist strategisch perfekt, die wichtigen Ausflugspunkte (das Meer, St.- Tropez, Nizza, Cannes etc.) erreicht man innerhalb von 30-60 Minuten Autofahrt. Eine klare Empfehlung für jeden der Ruhe in einer traumhaften Umgebung sucht.